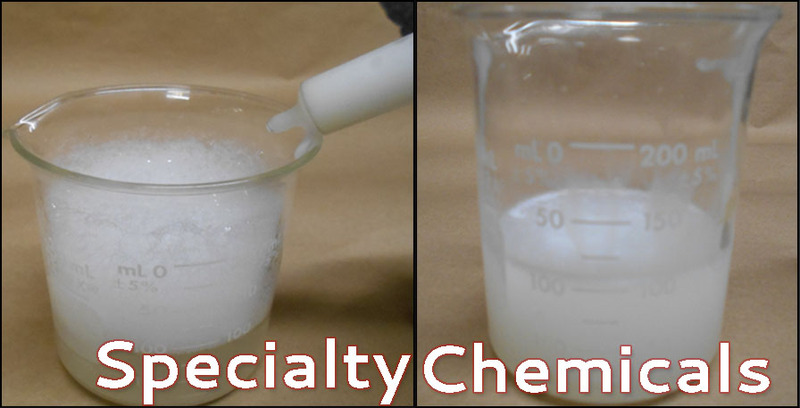 Specialty chemicals are formulated by WST for special application purposes. They cover a variety of functions. AF-10 ANTIFOAM: A stable, water based silicone defoamer recommended for wastewater treatment applications. CM-C: An inorganic liquid multi-purpose reagent for modifying components in wastewaters requiring treatment. CM-C substitutes for heavy metals under chelated conditions to permit their precipitation; acts as a co-precipitant in hydroxide precipitation of zinc and other metals; aids in the clarification and dewatering operations of the treatment process; and deactivates sequestering agents and phosphates in spent cleaners. CM-M: An inorganic liquid reagent for modifying components in wastewaters requiring treatment. CM-M substitutes for the heavy metals in chelated conditions to permit their precipitation, coagulation and flocculation ; demulsifies aqueous based coolants and cutting oils; and neutralizes the dispersing characteristics of surfactants in spent cleaner baths. CR-20: A liquid stabilized reducing reagent for the reduction of hexavalent chromium (and other high valence metals) to its trivalent state as a preparatory stage to precipitation. CR-20is also utilized as a reducing reagent for persulfate and permanganate solutions.